Some quiet thoughts : Reflections: STRONGER PART 6 | Conclusion. I came across a book early this year by Havilah Cunnington titled “Stronger than the Struggle”. I strongly recommend you read it. Much of what I am blogging here is from that book and what I did with a ladies group called Coffee Chats. If you find this useful, please feel free to use this material in a study group you might be leading. The blogs in this series are reflections and a summary of what I got from this fantastic book that I recommend you to buy. 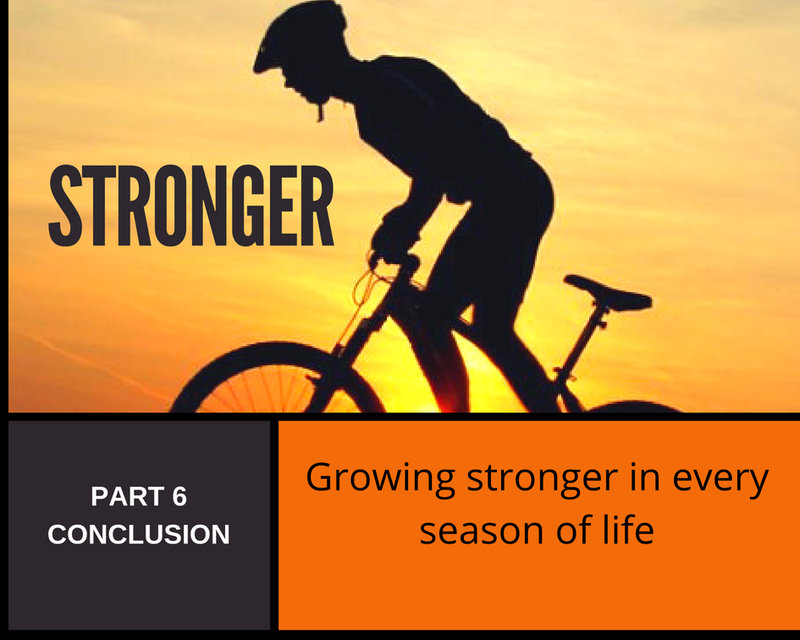 Click here for PART 5 of this Blog series. So we have seen how we need to identify the source of our battle i.e Internal, External or our belief system. We have looked at the weapons the enemy uses against us i.e theft, death, and destruction. These are his fingerprints. You know he is at work when you see any of these. We have looked at how we should respond, and the tools we have. Most battles are in our mind. We fight by taking every thought captive and replacing it with the truth. We fight with the word of God, opportunities of grace that God puts across our path, the rehma word. We also saw that it is important to trust, to yield to God. We need to replace fear with faith. Remember the devil is the chief enemy of your soul and he wants to destroy it so that he can keep you from your God-given destiny. Therefore in our daily lives how do we stay powerful? What am I responsible for? I am responsible for my choices and what I believe in. I can partner with the Prince of peace or partner with the spirit of fear and anxiety. We all get anxious every now and then. Then there are some who live under a constant cloud of fear. This is a spirit that you need to send packing by declaring the truth of the Word of God over your life and situations. Let’s look at the man beside the pool of Bethesda. He was sick for 38 years. Jesus asked him a strange question. Do you want to get well? What a strange question you might say? Jesus often asked this of people. He asked the blind man if he wanted to see. Sometimes we get comfortable with our problem that we actually empower it and give it permission to stay. This man has two excuses – First is complained and said that he had no one to push hint into the pool. That is a victim mentality I.e. no one understands, I am all alone, my situation is unique. It’s an isolation that Satan puts you under. I have been there. Like in the story, I mentioned. Because I did not get the help I was looking for, I felt isolated and a victim. While I did not get the help, I could have moved on. I could have looked upward to the One who is greater. He is the one who gave me the dream in the first place. Would HE not have enabled me? And enable me he did. He guided me to tools I needed and then there was no stopping. The second excuse was “Someone always beats me to it”. This is like saying, God, you have limited resources and it has run out on me! How ridiculous is that! Worse still is a comparison. We look at others people’s blessings and miracles and feel envious, jealous, we compare and get bitter and even get angry with God. Jesus full of grace asks the man t get up and walk. HE did not enable his victim mindset. Jesus gave him a chance to partner with his miracle. The man had a choice. Jesus asked him to get up. He gave him an opportunity to be powerful and do something. Blame leads us to get stuck in the mud. On the other hand, we see the Centurion. For him, the Word was enough. Both men faced a problem. One felt powerless and the other did what he could. Self-pity can make you feel powerless and get you so absorbed in the problem that you do not see the solution. You may even be right about the source of the problem but that will not get you unstuck. You have to partner with the miracle. Remember comparison is the enemies’ way of telling you that there isn’t enough to go around and that God is holding out on you. Excuses and blame don’t help change anything. We have to take responsibility for our selves. I learned this the hard way. It took me a few years to get out of that pity pit. I can’t do everything but I can do something! When you have a speck of dust on your lens it ruins all your pictures, doesn’t it? The dust of distraction can make us ineffective. This is one more tactic the Devil uses. In those three vital years that Jesus ministered, he said some very important things and gave us very important advice. Jesus gave us strategies of how to deal with different people. Some will accept you and some will reject you. He tells us to shake the dust off!! Jesus knew that we would need a strategy to deal with offense. If we don’t know how to deal with this we will take this into every situation. It's not if offense comes, but when it comes. Offense is a trigger and a trap. An offense can take you hostage. The pain, the anger can hold you hostage. IT will color the way you look at everything. It will prevent you from taking steps towards reconciliation or trying to resolve a conflict. Offense rides on the ugly back of pride. We have all been there. We have either taken offense or given it. Now the word “take” offense implies we have a choice. I can choose not to take offense. IT is always a choice. I could either pick up the courage or seek clarification in a situation. I can choose to overlook the wrong done. I can choose to give the other person the benefit of the doubt. If I feel there could be a misunderstanding caused by my actions, I need to have the courage and ask what the matter is. The onus is then on that person to seek to keep the connection and respond or not. I have had to do this when there was a rift in a friendship. I sought to reconnect to no avail. Finally, a letter helped me understand what the problem was. I could not do more than that. The Bible says as far as it depends on you live in peace. Make every effort to reconcile. A relationship might never come to restoration but sometimes that is for the best. Praise God I can say today that there is reconciliation in the friendship. So whatever it, is we need to fight it. The Greek word “skandalon” is where we get the word scandalized. It is the stick in the trap that springs and closes the trap when the animal touches it. This is one of the deadliest weapons Satan uses against us. I have written a blog on Offence where I go into more detail on this topic. Offence affects the core of our heart. It is like drinking poison or allowing cancer to grow inside of us. The Bible warns us not to allow bitterness to take root in our hearts. We also need to beware of judging people. When we are able to deal with offence in a godly way it brings glory to God. What are the common offense s in our lives? Apart from our soul, the other big enemy of Satan is the church. He will do everything to keep us divided. A united body is powerful. He seeks to bring misunderstandings and make them irreconcilable differences simply because often one person is too proud to admit their fault. Jesus spoke of the spec in our neighbor's eye and the plank in our own. A plank is made up of tiny specs. Each offense that we accumulate will cause our vision to be impaired. Satan loves to cause division and destroy friendships, intimacy, marriages. The closer the relationship, the greater the offense and great the hurt caused. It takes one to forgive, but two to reconcile. God takes many and makes us ONE. Satan takes that one and tries to make many. We need to be very careful fo this. Do not allow it to build up. “An offence is an event, being Offended is a state you are in” Havilah Cunnington. When you take offense and nurture it you become offended. So deal with this one swiftly. Most days of our lives are lived out in the dailyness of mundane routine. Yet it is about discipline and staying the course. Then sometimes we hear how someone has had this amazing breakthrough in life. Someone gets this trip to an exotic place all paid for while you have been saving up for just a small holiday. We can get angry or feel cheated or we can celebrate God’s grace upon that person’s life. If we cannot celebrate another person’s happiness, blessing or grace, we will never be able to step into our own. We will block our own blessing. This is another trap. The enemy prowls around like a roaring lion seeking to kill and devour. Lions hunt at night or early in the morning. Those are vulnerable, weak times. That is what the devil will do. He will seek you out when you are weak and vulnerable. On a practical note, make sure that you are eating healthy, getting enough sleep and exercise. All these affect your emotional and mental balance as well. When you feel you do not have the strength to go on, call back to mind Lam 3: 22-23: His mercies are new every morning, great is your faithfulness. In your battle, you need good friends to be with you. Find friends who will pour fuel on your dreams and not your fears. Some of us need a change in friend circle. Proverbs tells us that bad company corrupts good character. Ask yourself: are your friends helping you grow in the things of God? Are they provoking you to live your dream and pursue your destiny whatever that might be? Are they honest with you when you need some truth to be spoken to you? Do they stand with you when you are in trouble or weak and vulnerable? What counsel do they give you and where does it come from? Miserable bitter people have a way of finding each other. So chose your friends wisely. We also need to be intentional about our relationships. Satan hates our friendships, marriages. Do not take these for granted. A lot of our struggles are in these very areas probably because we have taken things lightly and let things slide. To conclude: the Holy Spirit will never run. Jesus calls us to come and drink from so that we may never thirst again. So do not have a scarcity mentality. You will always have what you need. God’s grace, provision of favor is unlimited. They will never run out. If you think it will, you will not be able to celebrate another peon’s success. Fight the good fight of faith; Run you race, You have a destiny in God. What we focus most is what we reflect. What we think about the most will grow. We act from our thoughts and not independent of them. Our struggle will not last forever. A time will come when all this wrap like an old blanket. The battle will end. Christ will return and he will have our rewards in his hand. One day we will be with him forever. This study inspired me to write a song of Hope called “ YOU ARE STRONGER”. You can listen to it by clicking here. Jesus is stronger than all the powers of darkness, the trails, schemes, lies the devil will throw at us. I hope you enjoyed this series as much as I did share it with you. Drop me a line to let me know how it has benefited you. I pray that whatever season you are in, you will learn to fight well and grow stronger and fo on to fulfill all your God-given dreams.